Yes! We've Got Dreidels in Bulk at BulkDreidels.com! Buy Wood and Plastic Dreidels in Bulk Quantities from Chocolategelt.com! Please view current pricing and specials at Chocolategelt.com. Use this coupon to save 10% off your dreidel order! Applicable to ONLINE orders of products in Dreidels Category at Chocolategelt.com only. Begin Shopping for Dreidels Now! Wooden, metallic and basic multi-color #dreidels. Large wood craft dreidels and play gelt coins for a fun Hanukkah classroom project. 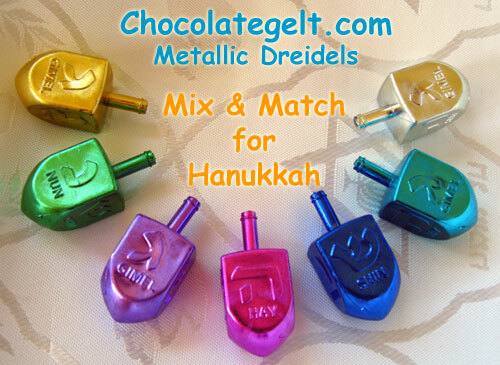 We also have fillable dreidels in blue clear and multi-color variety. Natural wood dreidels with Hebrew and English transliteration. One step solution for your Chanukah party celebration. Buy dreidels online and leave the rest to us. We ship from New York nationwide. Find it all at chocolategelt.com. Why pay more, buy from the source! These bright colored dreidels are perfect for Chanukah parties and gifts. Easy to spin. Kids love to play the dreidel game during Chanukah. We deliver these dreidels to your door.